The main steam condenser (MC) system is designed to condense and deaerate the exhaust steam from the main turbine and provide a heat sink for the turbine bypass system. The exhausted steam from the LP turbines is condensed by passing over tubes containing water from the cooling system. There is a main condenser unit under each LP turbine, usually below the turbine with its axis perpendicular to the turbine axis. 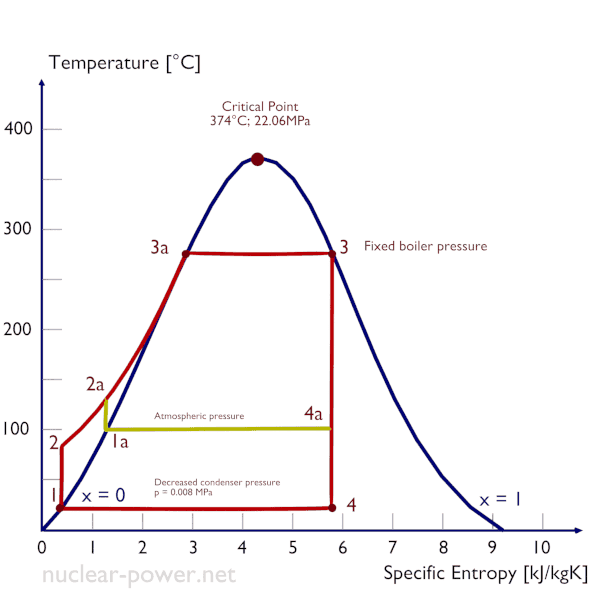 Since nuclear power plants usually contain also an auxiliary condenser (e.g. 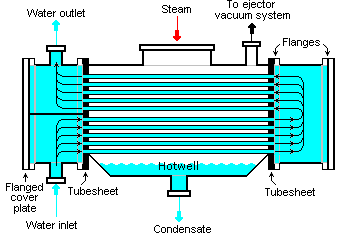 to condense steam from steam driven feedwater pumps), engineers use the term “main condenser“. 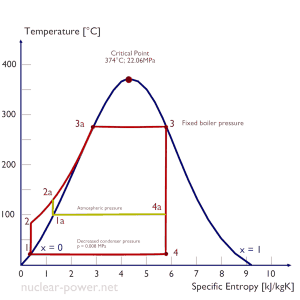 The pressure inside condenser is given by the ambient air temperature (i.e. temperature of water in the cooling system) and by steam ejectors or vacuum pumps, which pull the gases (non-condensibles) from the surface condenser and eject them to the atmosphere. The pressure inside condenser determines the overall power output of the power conversion system. Thermal power plants are usually equipped with so called “surface condensers”. Surface condensers (or non-mixing type condensers). In surface condensers, there is no direct contact between the exhaust steam and the cooling water. Jet condensers (or mixing type condensers). In jet condensers there is direct contact between the exhaust steam and cooling water. The water gets warmed in the condenser is discharged into the cooling system (i.e. cooling tower, river, sea, or cooling pond). The condensate collected from these condensers is reused as feedwater in the boiler. Since the cooling water and steam do not mix, the condensate is recovered and any kind of cooling water can be used. In comparison to jet condensers, in surface condensers a high vacuum can be maintained, therefore greater thermal efficiency can be achieved. On the other hand, surface condensers are bulky, requires large area and high capital costs. But these capital costs can be recovered by the improved thermal efficiency (i.e. higher )saving in running cost. Thus, these condensers are most suitable for modern thermal power plants. These are generally used where a large quantity of inferior water is available and better quality of feedwater is to be supplied to the boiler. In jet condensers, the cooling water is sprayed on the exhaust steam and there is direct contact between the exhaust steam and cooling water. The process of condensation is very fast and efficient, but here cooling water and condensed steam are mixed up. The condensate then cannot be reused as feedwater to the boilers. The temperature of the condensate is same as that of the cooling water leaving the condenser. Due to more intimate mixing of steam and cooling water jet condenser requires less quantity of cooling water for the condensation of steam. In general, jet condensers require less building space and they are simpler in construction and lower in capital cost. Despite these advantages jet condensers are not usual in thermal power plants especially due to the loss of condensate.